Mollies Pack has killed the well known alpha pair of the Hayden Valley Pack. I don’t have the details as to how it happened yet, but the Hayden Pack was being increasingly pressed by the larger Gibbon Pack from the SW and west and Mollies Pack from the SE. 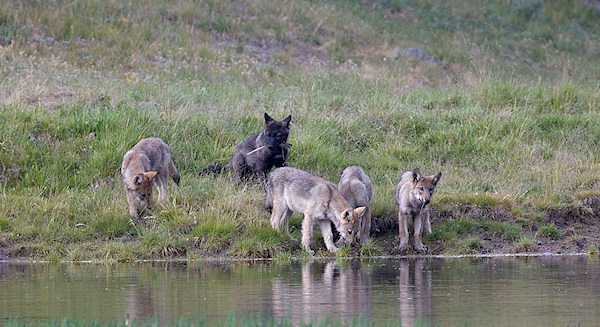 Remaining, but with their fate not bright, are the pack’s two sub-adults and the 5 pups. In the past, Mollies has had numerous rumbles with other packs, including the Druids. Folks might recall they killed the long time Druid alpha female 42F. It is very sad. When I had guests this summer they reveled in seeing the pups and white alpha female playing across from Otter Creek Picinc area. I just happened to be in the area this morning and drove by the spot (unfortunately) just in time to see park emplyees bringing (540F) out. The spot was near the Canyon stables just across the road to the east. There were many tears amongst the group. I have a feeling that there will be a lot more of this happening this year. The numbers of wolves in the Park is about as high as it has ever been but the prey is below what it was when the wolf numbers were this high. I think there will be a lot of inter-pack fighting. Its a sad day alright, my wife and I got to watch the alpha pair fend off a grizzly that was going after one of their pups. What a sad, sad day for the Yellowstone Wolf Project and everyone who loves wolves. The Hayden Valley pack’s beautiful and spectacularly visible alpha pair, 540F and 541M, delighted hundreds of thousands of wolf watchers over the past three years. How many park visitors made the journey to Hayden Valley just hoping to catch a glimpse of the famous white wolf and her family? 540F’s majestic beauty captured everyone’s heart. To look into her eyes was to look into the very soul of wild nature, and anyone who saw her was immediately hooked. Each person at Otter Creek Picnic Area last July will forever have emblazoned on their minds and hearts the unequaled opportunity we had to share in the daily life of a wolf family. The Hayden alphas gave us a truly great gift–the gift of connectedness and caring–the gift that wolves everywhere need in order to survive in our world today. The white snows of winter will soon come again to the Hayden Valley, but without the Hayden Valley alpha pair, 540F and 541M, the landscape has lost its very heart and soul. Let me offer an alternative perspective. But before I do let me say I spent many days in Yellowstone watching wolves when I lived in CO and spend a significant amount of time now working on wolf recovery in NM. I value wolves. I dream of the day when a pair of Mexican wolves are killed due to intraspecific strife. I would say that such an occurrence is evidence of how sucessful the Yellowstone Wolf Project has been. So an alternative perspective is that while the deaths of the alpha pair is tragic for one pack, it is joyous for the ecosystem. To me it is not a sad event, but another reflection of the beauty and complexity of the natural world. I love watching wolves. But wolves are not there solely for our recreational pleasure. They serve a critically important role in the ecosystem ….. and when they are active in that role intraspecific strife will occur. This is in no way meant to inflame or incite. And to those who will miss the opportunity to watch 540F and 541M I am sincerely sorry. I just hope we don’t lose sight of why wolves are important to Yellowstone and the rest of western US. I only had a few brief glimpses of the alpha female and that was enough. Just to know that they were there was all I needed. I learned many years ago to not attach to any one animal. There was 163M who’s image hangs on my wall reminding me how careless I was in getting so close that I changed the behavior of this big guy who was trying to cross the highway near the Institute. Or 39F also a white female and the first wild wolf I ever had the pleasure of viewing as she trotted just below tree line near Soda Butte. Both animals met untimely deaths shortly after my encounter with them and both taught me lessons about impermanence. What will happen to the pups now? As I understand there are no real adults left in the pack, only teenagers, so to speak. Jeff, I do agree. The White wolf was special. I just photographed her and the pack Saturday in the way only they could preform. Not shy and fearful of man, nor boldly begging, just going about there way and allowing me to watch them carry on the business of being wolves. The ability to closely observe these wolves may be gone since it is possible that the pups have also been killed. I don’t believe they have been seen or heard in the past couple of days but many will be checking for them in the few days the road remains open. Someday I too would love to see a alpha pair bringing their pups to the shore of Luna Lake or the banks of the San Francisco near my home away from Yellowstone. Good luck on the Blue Range. I think it is unlikely that the pups will survive but it does happen. For instance, an orphaned female pup from the Stanley Pack later became the alpha female of the Orphan Pack near Cascade, Idaho. She didn’t reproduce very well for some reason though. Maybe it was because she didn’t get the right nutrition when she was young or maybe there was something else going on. For a few years she only had a single pup but the last year that she was known to be around she had 5 pups. In Yellowstone I find it more unlikely because of the large number of wolves that they have to contend with. Those teenager wolves may have enough experience to help the pups or they may just disperse and leave the pups to fend for themselves. Weird things have happened there though. I can’t remember any time in the past where both of the alphas were killed at the same time. Does anyone else remember? Something similair happened back in the winter of 1997-8 with the Thorofare Pack. This was one of the first packs to form naturally after the wolf release. A pair of released wolves met and moved to the Thorofare where they had five pups. Meanwhile, the Soda Butte Pack, which was a wolf manager created pack ,and had been at Heart Lake for several years and getting low on elk, surprised the Thorofare alpha male (who was a very big wolf), and killed him near the Yellowstone Delta. The alpha female and a pup tried to get out of the Thorofare through Eagle Pass, but an avalanche got them. I do recall that the rest of the pups made it out of the wintery Thorofare by some other route. I don’t recall their ultimate fate. The Soda Butte Pack was renamed the Yellowstone Delta Pack after its last original member died, and it has ruled the Thorofare since, spinning off numerous other packs southward into Wyoming. During the past three summers I was lucky enough to see & photograph these two wolves and their pups. With all the time that I spent watching the northern range wolves over the past few years and tracking the Druids during March of ’02 during my time with the wolf project, I couldn’t have asked for more visible and interesting animals to be lucky enough to spot through my camera viewfinder. That being said, it is sad that the time for these two wolves has now passed, but others will be able to take their place. Aren’t we lucky to have the chance to see these animals in their natural environment? My daughter and my niece were about the 1st people to see 540F in Yellowstone. They reported it to the wolf team at the Institute. The summer of ’06 we were able to see 540 only through quick sightings. The last day of our visit we saw her for a moment way down in Hayden Valley. She came out for only a few minutes and then went back into the woods. It is a sad day for the wolf lovers of America!!! She was a beautiful wolf and loving mother and grandmother. She will be missed greatly!!!!!! Also a sad day for europes wolf lovers! Todd, you are of course right in your rational assessment of the situation and I fully agree with you…But for today I prefer Kathy´s perspective and I´m not ashamed to shed a tear or two! Have a fine day everybody out there! I am still in shock about the Hayden Alpha pair. I just received an email from a friend the other day showing us recent photos of the Hayden pack. I of course being a wolf lover showed everyone around my office. I remember the first time we saw the Hayden pack in October of 2004. They were so far out in the valley we thought we were looking at a white sheep and we knew that Yellowstone did not have any at that time. We kept looking through our scope and saw 5 grizzlies and then figured out that we were also watching wolves. We were flagging people down to look through our scope to prove to everyone that we were seeing a white wolf. We let children and adults both look in our scope and I will never forget that moment. I love to see people reactions when they see a wolf. (especially the children). Yes, I have shed many tears over the Yellowstone wolves. I will never forget the time we spent in Hayden Valley over the past 3 years viewing these 2 wolves. Thanks to everyone who has been involved in the Yellowstone wolf project and many friends we have met through the Institute you have made my life so complete. A special thanks to the Hayden pack for allowing us to view them and for helping educate the world about wolves. They will be very missed!!! In June 2006 I saw 541 crossing Alum Creek. I was lucky enough to get 30 seconds of video. I also had the pleasure of seeing 540 a few times. Last summer, 2007, I hosted at Canyon Campground and watched this incredible pack almost every night after my rounds as host. Hundreds of people saw their first wolves, the Hayden’s through my scope and shed a tear. I’m going to miss their magic and beauty when I return next May. This is just heartbreaking news. As I work in the park and live at Canyon, I have watched these beautiful wolves many, many hours, and treasured their their willingness to share time with us. I have thought all along the father of the second litter was one of the Mollies blacks I saw in Hayden a number of times this summer, so perhaps they will be accepted by their fathers pack. I have no idea how likely this is, or if there is any precedent, but “it would be good”, as we say…. Canyon will not be the same for me. I worked at Bridge Bay CG and spent all my extra time waiting and watching for the Haydens to appear. At the site of 540, I would scream in delight, sometimes out loud, but always in my soul. It was awesome to be able to show visitors her beauty through my scope. This gave the opportunity to talk to people about the wolf and its balance on the Yellowstone ecosystem. She and 541 gave a lot of joy to me and others. Standing on Grizzly Point will not be the same, for I know the tears will fall but the smiles will be there also for the memories I have of being in their audience of awe struck admirers. I often referred to 540 as the regal white wolf: she did her job of bringing excitement, tears and knowledge to many. I feel we have a responsibility when we return to YNP to continue to educated visitor about the wolf plus share our stories. The wolves have brought folks together. That makes the watching even more special. I have met a lot of people while waiting for the Haydens to appear. It becomes even more exciting to share the moments and the scopes and binocs with others, especially the children. The little folks seem to always be speechless when they look through the lens and get a close-up view of the animals. Linda sums it nicely—Share the knowledge. Steve Erwin always said that “people want to save the things they love.” When folks learn about the animals they really start caring too. I am very sad that we will not see that beautiful pair again. But, we have wonderful stories to share with others. I am new to the Yellowstone area, but wolves are what brought me out here. I moved out in April and was lucky enough to see wolves in Yellowstone in early May. The pack that I first spotted was the Hayden pack. I watched one of the adult members (not one of the alpha pair) feeding on an elk they had killed in Alum Creek. I watched the wolf feed and then watched as he left with some of the meat to take back to the den. I was fortunate enough to be there when a park ranger was there and learned a tremendous amount about this pack. I then made a habit of going and looking for this pack. I stopped at the Grizzly Overlook something like six times this year and was able to see all of the pack together each time I did so. On the last time I was able to do this before they moved from that rendezvous site, I was able to bring my parents and my grandparents, in their mid-80s, to see wolves in the wild for their very first time. They all marvelled at how beautiful 540F was and were absolutely thrilled and touched by the experience, even at that great distance and watching them with binoculars and spotting scopes. I definitely felt a connection to the Hayden Pack, even when I have seen several other packs this year, and will definitely miss them. That being said, when the alpha pair was killed, I am glad it was other wolves. I would have been terribly upset had they been killed by humans, such as being struck by a car. Tuesday I met some people who had seen an injured wolf in the Canyon area. They talked about its color and its substantial injuries and I just knew it was 540F. They had taken pictures and when I saw them, she was easily recognizable, even as injured and bloody as she was. It broke my heart to see those pictures. Wednesday I went right from West Yellowstone to the Hayden Valley and have been keeping up on the news. This lovely alpha pair will definitely be missed, but Wednesday I got to watch Mollie’s Pack as they howled. I had heard wolves howl in the wild, but never seen it until then. Yesterday I was up in the Lamar Valley and saw the Slough Creek pack for my first time. Wolves are here to stay in Yellowstone and as much joy as the Hayden Pack has given me, I know that I will continue to seek out wolves and continue to feel connected to them. I enjoyed many wonderful hours watching these two, I am so sad to hear they are gone, I will miss them dearly. As hard as this news is for me. Part of me is also glad to be able to have natural wolves with the capability to do what is natural to them in Yellowstone. We are so lucky. So many people have seen the Hayden alphas, and they have been wonderful ambassadors for the Yellowstone wolves. I have seen such joy generated from these two. Still I look on my wall today at one of Dan Hartman’s shots of one of this years pups and I worry that I will never see them again either. I do hope they manage. I will miss 541M bold and beautiful (I worried for years a car would get him, I am glad that if he had to go it was this way) and will miss beautiful 540F, in my opinion the loveliest (and one of the strongest) wolves in Yellowstone. I went into Hayden Valley today, stopped at Grizzley Point and said thank you to 540 and 541 for filling the photo albums of my mind and soul with such awesome images. May their spirits always float above that beautiful valley. All 5 pups and 1 subordinate were still in the area where the attach occurred. Some of the Mollies were seen claiming the territory also. So hopefully that is a sign that the pups will survive and be intergrated into the Mollie’s. Some say that is unlikely, but with the pups still alive 3 days after the attach we can hope it will happen. My husband and I had the extreme pleasure of observing the Hayden Valley wolf pack this summer. Our photos had not come out, so tonight I was researching photos of the pack to order for Christmas gifts, when I came upon the terrible news about the alpha male and female. I cried like I had lost something very special, which is what our experiences were this summer. If anyone can share any photo sites of the pack, please do. I just learned of this. I have finally composed myself enough to leave a comment. I spent a great deal of time in the park this year. 45 days in the spring and two weeks in August. I would like to say that the Hayden Valley pack was the first wolves that I saw in the wild. But that honor goes to a solo black I saw at Swan Lake flats in late May. However, 540F was the first wolf that I saw close enough to get a reasonably good photo. It was across from Otter Creek in early June, she was by herself crossing the inlet where she later brought the pups to the water. Also in June I watched the pack attempt to take down an elk in Alum creek. I spent some time almost every day of the two weeks in August watching the entire pack in Hayden Valley from Grizzly Lookout with some of my family. It was a joy to watch them and every time I thought the experience couldn’t get better or more exciting, it did. There was one day that we watched the adults chase what appeared to be a member of Mollie’s south from their rendezvous point all the way across in front of Grizzly lookout and out of view to the south. I first Met the Hayden Pack at Grizzly Point on Oct. 23, 2007 and saw qnd photographed them almost every day until the alphas were killed and for a few days after. All, I have to admit I was crying as I read posts here. I was in YSNP on 11/3/2007 and I did not even relized what happened until I got home. I saw black BIG wolf of Mollies and 2 other running on the road near canyons. I am sure I saw Haydens female in May. I am glad that it was mother nature.. Thank you for the wonderful posts..
Larry, You have some stunning images of these beloved wolves. I encourage others here to have a look for themselves. What shows Sir, do you have in the works for Spring/Summer ’08? Thanks for bringing these captures to our attention. I was in the park a day after the Mollies attacked and the two packs were still near eachother, hayden retreated and Mollie followed crossing the Yellowstone River in the early morning. Went back to the park that Sunday and had a beautful encounter with the Mollie Pack, was able to get a picture of the Alpha Male. I won’t have my art show schedule for the summer for a few months yet. I will leave a post when I do. I will apply for both Jackson, Wyoming shows, but some years I get in and other years I don’t. Very early (too dark for photos) Monday Oct.29, Bob Landis and I watched the entire Hayden Pack run past us (they ran within 10 feet of me) to chase down a coyote carrying a piece of elk hide and retrieve it. One of the wolves carried the hide back to the kill area on the North side of Cascade Meadows. There was a large Grizzly eating part of the Kill and the wolves were very aggressive toward the bear and one wolf let out a loud yelp as the bear struck out at them. The Mollies are getting all of the blame for killing the Alpha Haydens, but the male was discovered with a grizzly feeding on him a few days later at another kill. I wonder if the Grizzly might have been a factor in their deaths. Both of the Hayden Alphas were wearing non-working radio collars at the time of their deaths. I can’t help but speculate that radio collars might be a big handicap when in a fight to the death with other wolves. The radio collar looks very tight and uncomfortable on the white wolf (one week before she was killed) in the photo of her howling that I have posted on my website. Cost will be $15.00 plus shipping.